We’ve reached the point of the season when we can no longer ignore or minimize results. With 22 of 30 teams at least 25 games deep, we now have a large enough sample size to get a read on how things might unfold from here … all the way to the playoffs. All of which is to say this: It’s time to start taking early records and run differentials more seriously, because it’s not that early anymore. I’m still not ready to dismiss a few highly talented teams that are off to slow starts, and I’m going to keep dinging a couple of overachievers that seem to be winning with smoke and mirrors, but I’m ready to tip my cap to some of the clubs that have defied preseason expectations and demote others that haven’t performed as well as hoped. So, yes, Brewers fans, you can stop with the hate mail. I see you. It’s Week 4 of The 30. Do you hear the people sing, singing the songs of high draft picks? When talking about the Astros, it’s tempting to discuss their future. After all, this organization boasts arguably the best farm system in baseball, but might be headed for a fourth consecutive 100-loss season at the major league level. Piling on the Astros is getting old, though. They stink, and that’s obvious. But there are some silver linings to brighten what figures to be another lost season. For starters, they’re hitting just .182 with runners in scoring position. While that’s not a good thing on its face and puts Houston last in the majors by a wide margin, it’s also not going to last. The 2013 Cubs posted the lowest batting average with runners in scoring position this century, at .218. Even the 111-, 107-, and 106-loss Houston clubs from the past three seasons managed to hit .241, .234, and .258, respectively, with runners in scoring position. The Astros are bound to improve in this respect. The Astros are also hitting ’em where they are. Though batting average on balls in play is in part a function of skill, it’s still worth noting that Houston’s BABIP ranks dead last, at .250. (The MLB average is .297.) This, despite ranking ahead of the Blue Jays and Royals in line-drive percentage.2 Among players with 50 or more plate appearances, the Astros have two who rank in the bottom five in BABIP: Robbie Grossman (.138) and Marc Krauss (.152). Krauss will likely bounce back given how rare it is for numbers to remain that low all year, while Grossman has already been shipped to the minors to make room for George Springer, meaning the Astros can also expect to improve in this area. As for the pitching: The bullpen has been predictably awful, since teams that know they’re going to be bad have no reason to invest in relievers, but the rotation has actually shown signs of life. Left-hander Dallas Keuchel, 26, has improved across the board in his third big league season, striking out a batter an inning and inducing more ground balls than any other starting pitcher. Collin McHugh, who’s also 26, has been even more intriguing. The Astros grabbed the former Mets 18th-round draft pick off waivers and called him up on April 21 to replace injured righty Scott Feldman, and McHugh has been unhittable in his first two starts. First, he obliterated the Mariners, striking out 12 and allowing no runs on three hits over 6⅔ innings while nabbing the first win of his big league career. Then, he showed he could go deep into games on Sunday against the A’s, firing 8⅔ innings of two-hit ball, surrendering a single run on three walks, and whiffing seven over 114 pitches. While McHugh’s surprising success might be a case of exploiting a weak Mariners offense and catching the A’s on a bad day, it’s also indicative of what teams need to do when they’re all but mathematically eliminated by the start of spring training: throw spaghetti against the wall and see what sticks. The Astros are going to build around Springer, Jose Altuve, Jason Castro, and the next generation of young talent that’s currently percolating in the minors. If they can find even two or three other useful pieces on the major league roster to supplement that core, they can call this season a win. And hey, if they bank a third consecutive no. 1 overall draft pick, they’ll reap the rewards that terrible teams are supposed to reap, even if it’s ugly to watch … and even if no one is watching at all. They’re showing signs of life, but they need to do more to earn the “contender” label. I’m going to start this Jose Abreu tribute by sharing a decidedly nonanalytical story. On Friday night, I was sitting with Baseball Tonight analysts Eduardo Perez and Doug Glanville, watching the ninth inning of the Rays–White Sox game.3 Rays closer Grant Balfour began melting down, allowing a double, then two walks, then nearly getting into a fight with Paul Konerko. Perez started shouting at the TV, “Don’t let this get to Abreu! You’d better get out of this before getting to Abreu!” The next batter, Adam Eaton, hit what looked like a game-ending double play to second, but a slightly botched relay between Ben Zobrist and Yunel Escobar allowed Eaton to beat the ball by a hair. Rays manager Joe Maddon challenged the call, causing Perez to jump out of his chair. “You’re messing with Balfour’s timing now! Abreu’s going to go yard if he comes up, watch out!” Facing rookie Marcus Semien, with Abreu on deck, Balfour inexcusably started nibbling, throwing a 2-1 slider that missed the strike zone by a mile, and ultimately issuing the walk. Up strode Abreu, the 255-pound, 27-year-old rookie with light-tower power. “Game over right here!” yelled Perez. And he was right: On an 0-1 count, Balfour threw a fastball, middle-out and thigh-high. Abreu crushed it to deep right, into the Chicago night and over the wall. The room exploded. Perez and Glanville played a combined 22 years and 1,869 games in the big leagues, enough to have seen it all. Yet they still high-fived and celebrated like one of them had just cranked the walk-off grand slam. They weren’t the only excited spectators: It’s a minor miracle that Hawk Harrelson didn’t have a coronary while calling the play, and the Spanish telecast’s “Sayonara, baby!” call was a delightful touch. 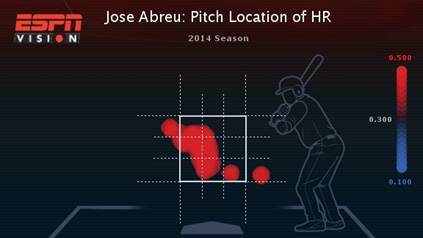 That’s the kind of impact Abreu is having. He’s got fans and former big leaguers alike predicting game-winning home runs five batters before he can even step to the plate. He’s turned a moribund White Sox team into a must-watch outfit every night. And so far, he’s making history. People in baseball began predicting big things for Abreu years ago, when he was putting up video-game numbers in Cuba and no one knew when he’d make the trip north to the United States. But not even the biggest optimists could have predicted what he’s done. Through 26 games, Abreu leads the American League in home runs (10) and runs batted in (31). He’s already broken the all-time record for most homers and RBIs by a rookie in April, marks previously held by one of the most dynamic rookies (and most terrifying sluggers) ever to play the game: Albert Pujols. To figure out how Abreu has done it, let’s dig into the numbers, with a big assist from ESPN Stats & Info. Abreu hasn’t victimized only patsies, either. Sunday’s two-run bomb came against 2012 Cy Young winner David Price. On April 22, he took 2011 Cy Young winner Justin Verlander deep. He’s also tagged impressive Rays right-hander Chris Archer and Rangers lefty Robbie Ross, who owns a 2.45 ERA. For all his dominance against outside pitches, though, Abreu has been relatively toothless against pitches on the inner half. Going by ESPN Stats & Info’s well-hit average stat, we find that Abreu ranks just 141st in baseball; he’s slugging a pedestrian .409 on those same pitches, ranking 76th in the majors. Pitching coaches study scouting reports, and will undoubtedly adjust accordingly. When those inside pitches start coming more frequently, it’ll be the first real major league test for Abreu, whom skeptics knocked before this season for having too long a swing. We don’t yet know if he’ll pass that test. We do know that he’s already become appointment TV. We’ll figure out what to make of these teams … eventually. You know that shifts phenomenon? The one that has teams putting fielders in weird spots more than ever before? The one that has the shiftiest team in baseball, the Astros, on pace to nearly triple the number of shifts put on by last year’s leading team? Well, the Rockies never got the memo. They’ve shifted just 12 times this season, the lowest total in the league. And it’s not making a lick of difference. According to Baseball Info Solutions, the group that tracks data for shifts and all kinds of other defensive metrics, the Rockies have saved 17 runs with their D. That’s the second-highest total, behind the Braves, who employ the best defensive shortstop since Ozzie Smith.4 And that terrific defense is merely the subtlest of the many reasons why Colorado has looked better than almost anyone expected. The team’s weekend series at Dodger Stadium brought all those factors to the fore. It started Friday night, when Jordan Lyles silenced the Dodgers bats over seven innings, ceding just two runs on six hits. When the Rockies traded Dexter Fowler to the Astros for Lyles and outfielder Brandon Barnes over the winter, many saw the deal as a steal for Houston and a bust for Colorado. So far, Lyles has quieted the critics by doing two things really well: avoiding walks and inducing tons of ground balls. He walked just one batter Friday while prompting 12 Dodgers groundouts (compared to five flyouts), raising his ground ball rate to 57.6 percent, the fourth-best mark in the NL, while dropping his ERA to 2.93. Even more impressively, he’s allowed just a single earned run over 13⅔ innings while toiling at the pitcher’s death trap that is Coors Field. Then there’s the emerging greatness of Nolan Arenado. The second-year player has picked up where he left off last year, establishing himself as the NL’s best defensive third baseman. What’s new is an offensive surge that could make him one of the best all-around third basemen in either league. After a 2-for-4 performance in Sunday’s series-clinching 6-1 win over the Dodgers, Arenado is now batting .298 with 10 extra-base hits and a .471 slugging average. There are still holes in Arenado’s game, especially his complete lack of interest in drawing walks: After taking just 23 free passes in 514 plate appearances last year, he’s walking even less frequently this season, with three bases on balls in 109 plate appearances. Still, we’re talking about a 23-year-old third baseman who plays all-world defense, has the offensive upside of a .300/25-homer hitter, and is team property through 2019. The Rockies have been seeking a third impact player to ride shotgun with Troy Tulowitzki and Carlos Gonzalez for years now, and Arenado might be it. So, is it really time to get excited about the Rockies? Well … maybe. Though Colorado leads the NL in runs scored and home runs, the rotation hasn’t been particularly good beyond Lyles, even after adjusting for Coors effects. The series win at Dodger Stadium notwithstanding, the Rockies have played a bunch of weak opponents, going 7-6 against the Marlins, Phillies, Padres, and Diamondbacks, and taking two out of three from a White Sox team missing Chris Sale. The biggest elephant in the room is Tulo’s health. We’re seeing what Tulowitzki can do now when healthy, combining a .342/.449/.646 batting line with Gold Glove defense of his own. But he also played in just 173 games combined over the 2012 and 2013 seasons, and has played more than 126 games just once in the past four years. If he can stay on the field for 150 games, we’ll be talking about a legitimate MVP candidate. And maybe, just maybe, a little playoff noise in Denver. These nine teams could make some serious noise. Well, despite still having 10 players on the disabled list, the Rangers are tied for the best record in the American League. And help is on the way. Matt Harrison made his first start in more than a year on Sunday, shaking off major back and shoulder injuries to shut down the Mariners. The lefty tossed six innings of three-hit ball, leaving the game with a 5-2 lead. The bullpen blew the game, thanks to a three-run blast by underrated Mariners third baseman Kyle Seager in the eighth.5 The pen should get a boost soon, though, with Tanner Scheppers eligible to return from the DL next week, and the hope he’ll be far more effective as a reliever (1.88 ERA and 59 strikeouts against 24 walks last year out of the pen) than he was as a starter (9.82 ERA, 27 hits, eight walks, and four homers in 18⅓ innings in the rotation this year). All-Star third baseman Adrian Beltre and staff ace Yu Darvish have already returned from early-season DL stints, and no. 2 starter Derek Holland is ticketed for a June return after knee surgery. The hope is that Jurickson Profar will also return in June to claim his starting second-base job, and that Geovany Soto will return not long after so that the Rangers can blast J.P. Arencibia to the farthest reaches of the galaxy. Look for the Rangers’ luck to improve in other ways, too. Though there have been a couple of moderate overachievers on the roster, none has provided enough upside to match the drag that Prince Fielder has placed on the team with his miserable .209/.339/.330 start. Fielder’s going to heat up, and barring injury, he’s going to blast a bunch of homers before long. It’s possible that Fielder might not roar all the way back to career norms, though. Teams have put on defensive shifts in 64 Fielder plate appearances this year, making him the fifth-most frequently shifted-against player in baseball. Per Baseball Info Solutions, Fielder is hitting .286 when teams don’t shift against him, but just .143 when they do. The biggest wild card, though, could be starter Martin Perez. The four-year, $12.5 million deal the Rangers gave Perez in November looked like it would be a bargain even if he simply performed like a league-average pitcher over the life of the contract. Instead, Texas seems to have a beast on its hands. The 23-year-old lefty has fired 26 consecutive scoreless innings, including back-to-back complete-game, three-hit shutouts. He hasn’t been facing cupcakes, either, stifling the White Sox (who have the top offense in the majors) and the A’s (who have the fifth-highest scoring unit) in those two complete games. A few of his numbers jump out as unsustainable, starting with his zero homers allowed in 38 innings. And it’s also fair to wonder how long a pitcher with one of the lowest strikeout rates in the league can keep dominating opponents. Well … possibly for quite a while. Perez has thrown a ton of sinkers this year and induced an obscene amount of weak contact, as he’s generating ground balls at the second-highest rate among all starting pitchers. Between all that weak contact and allowing just nine walks in 38 innings, Perez hasn’t allowed many baserunners. When he has, the ground ball has been his best friend: He’s induced 11 double plays in 2014, tops in the majors. If Perez can keep this up, or even come close, Darvish will have an elite running mate at the top of the rotation. And when Texas’s remaining DL cavalry arrives, the rest of the league should officially be terrified of what the Rangers might do. 29 percent when there were 28 MLB teams; 27 when there were 30. Line drives fall in for hits far more often than fly balls or ground balls, thus hiking BABIP numbers. As long as I’m shamelessly name-dropping, here’s me on Late Night With Seth Meyers to promote my new book, Up, Up, & Away. Come at me, Omar Vizquel fans. Seager’s eighth-inning blast was his second homer in two innings; the M’s can only hope this is the turning point for an offense that ranked dead last in park-adjusted offense heading into Sunday.